Hear the half-hour show now at heritageradionetwork.org Greenhorns Radio, Episode 197, guest Jan Lundberg. Host: Severine Fleming, Director of Greenhorns. Background for Sail Transport Network readers: Greenhorns partnered with the Vermont Sail Freight Project when it made its historic voyage down the Hudson River bringing food cargo last year. "Severine is a long-time, dedicated activist for access to farmland and a sustainable farming movement led by those essential foodies, young farmers," said Jan Lundberg. Jan Lundberg is a former oil industry supply analyst who left the industry to immerse himself in the environmental movement with an emphasis on energy issues. He founded the Fossil Fuels Policy Action Institute in 1988. Projects included the Alliance for a Paving Moratorium, the Auto-Free Times, Pedal Power Produce, and CultureChange.org. The organization formed in 1999 its most enduring project, Sail Transport Network (STN), promoting the use of sail for cargo and passenger transport. STN is now a Partner of SAIL MED. 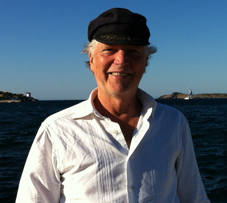 Jan sailed from California to Greece decades ago, and after touring Europe in 2012 realized that the continent is currently at the center of the new sail transport movement. He lives in Greece, where he is building projects and aligning interests for SAIL MED. This program was brought to you by Heritage Foods USA. First aired July 15, 2014. Please support Sail Transport Network, SAIL MED and the sail transport movement. See STN's website for online donating. See SAIL MED's recent press release announcing its formation.